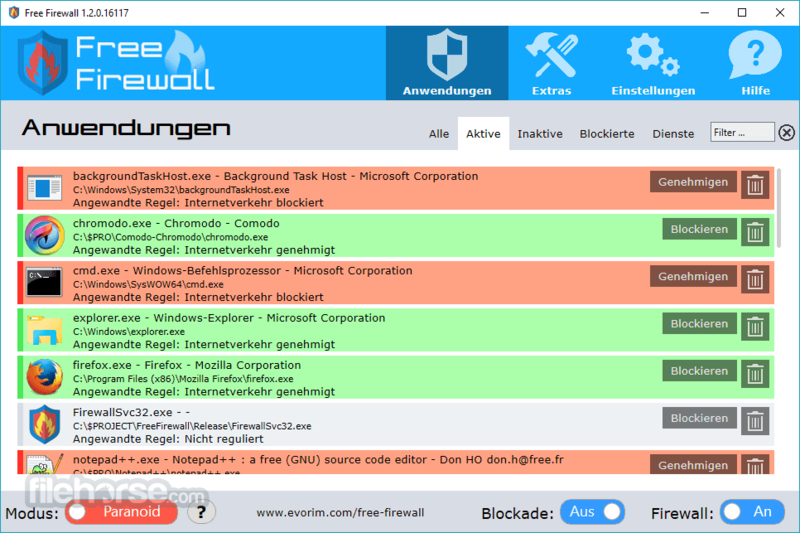 Free firewall is a full-featured professional free firewall that protects against the threats of the Internet. Control every program on your computer by permit or deny access to the Internet. Free Firewall will notify you if applications want to access the Internet in the background, without your knowledge. In Paranoid mode, no software can access on the Internet or network, without your prior consent. You have full control over the flow of data out of your system and into. 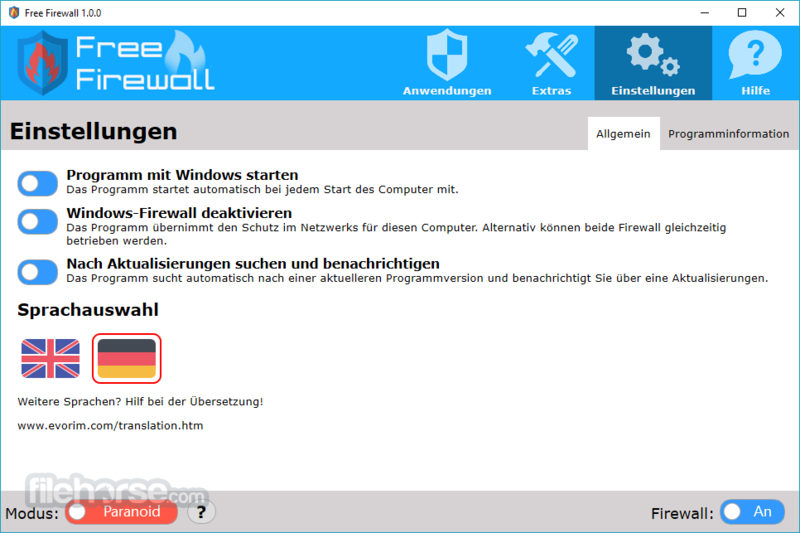 Free Firewall download for Windows today! Prevent the attacker to get access to your computer by exploiting security vulnerabilities. Protect yourself from a remote access and control of your system and access to your personal information. Protect yourself, your privacy and your personal data, by preventing the intruded malware from access to the Internet. Prevent that viruses and worms spread on the network. Individually regulate the access to the network and Internet per application. Allow access to the Internet only those programs, you unconditionally trust. If a non-regulated program wants to access the Internet, you will receive immediately a notification with which you can permit or block the Internet access. Trust no one! In Paranoid mode, no software can access on the Internet or network, without your prior consent. Only applications which you trust get Internet access. Are you a credulous person? You have no fear about your privacy? In Credulous mode, all applications will have access to the Internet or network until you explicitly prohibit it. Free firewall is not only a full-featured firewall, but provides additional features to protect your privacy against attackers. Prevent that tracking services on web sites analyze your surfing habits. 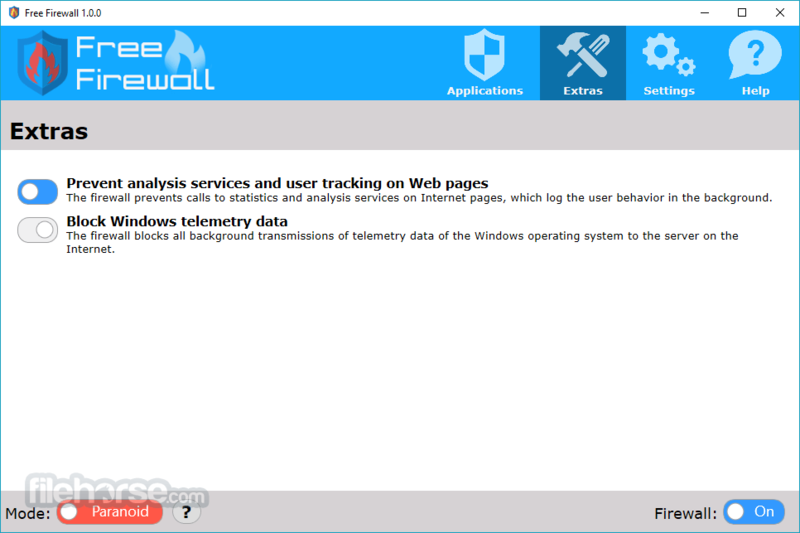 The firewall prevents calls to statistics and analysis services on Internet pages, which log the user behavior in the background. The user interface is optimized for touch sensitive devices. Thus you can operate the software on your desktop PC and laptop with the mouse as well as with the fingers on tablets and Ultrabooks. Stop the download of telemetry data of the respective software manufacturer and and the Microsoft Server. The firewall blocks all background transmissions of telemetry data of the Windows operating system on the server in the Internet. Anti-virus software only protects against known threats. New viruses are only taken after weeks into the anti-virus database. In the meantime, a virus can wreak havoc. With Free Firewall you determine which program transfer data in the background and prevent them. So your personal information doesn't fall into foreign hands. Botnets consist of a lot of computers that are running a malware in the background and can be remotely exploited for attacks. Free firewall notifies you about data transfer in the background, which you can quickly block. Unlike many other Firewalls, Free Firewall can be operated with any other firewall in parallel. Also with Windows Firewall. So enjoy a higher level of protection and combine different functions to their added value and without extra cost. The user interface has been translated into your language, so you can get the full protection. And that for free! Is your language still not under the translated, so help and translate with us! Supported operating systems: Windows 7, Windows 8, Windows 8.1, Windows 10. Supported server operating systems: Windows 2008 R2, Windows 2012, Windows 2012 R2. Hardware requirements: 128 MB RAM, 1 Ghz CPU, 100 MB Storage space.